We’re expecting a lot of things from the LG G6, but one thing it might not be is water-resistant, as new renders show it in a waterproof case – something which wouldn’t be necessary if the phone itself was waterproof. While case renders can never be taken as fact, they are often based on information supplied by the phone’s manufacturer, so they’re worth considering. But the absence of any sort of waterproofing on the LG G6 would come as a surprise, as although the LG G5 and other handsets in the range don’t play nice with liquids, an official teaser for a phone believed to be the G6 has mentioned waterproofing. A waterproof design has also been rumored elsewhere, and many rivals offer some level of water-resistance, so we have to cast serious doubts on the accuracy of these renders. The renders, posted by Ghostek and spotted by BGR, don’t give a huge amount else away, but the design of the G6 appears to be similar to that of the LG G5, complete with a metal build, a fingerprint scanner on the back and a dual-lens camera. Though this time the camera sits flush with the rear of the phone, whereas on the G5 it sticks out slightly. 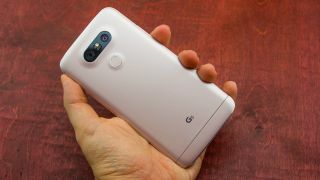 The design largely lines up with earlier leaks and rumors, though given the muted response to the design of the G5 it seems odd that LG wouldn’t rethink things for the LG G6. We should know the truth very soon, as LG is expected to announce the G6 at its MWC 2017 press conference on February 26.